We launched SAEOnLine during the first week of July 09 after a reasonably long period of development, and boy are we excited! 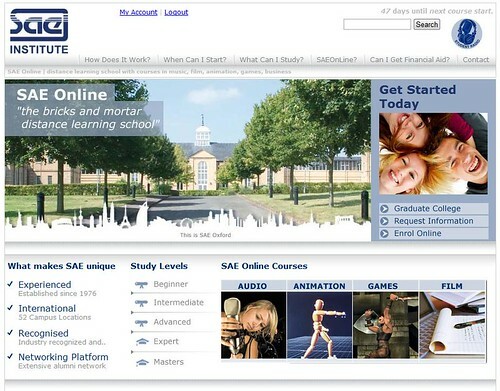 SAEOnLine is a fascinating project which is the culmination of Audiocourses.com distance learning experience and SAE Institute's three decades of face-to-face instruction in over 50 campuses around the world! A significant amount of the development has been organisationally related, in that a project of this scale sees the coming together of many differing people with various vested interests and process requirements. We worked, and continue to, alongside SAE Institute and their key stakeholders to ensure that we met the appropriate requirements in terms of integrating with their current administrations systems and culture. With an estimated 50k concurrent students at any point, you can imagine data quality is top of the list. SAE wanted a solution which enables them to provide short-cours creative media education education everywhere in the world, along with laying the foundations for graduate and post-graduate degrees, both on and offline, essentially "mixed-mode" learning. We have an on-going relationship and will bring you up to speed as and when.